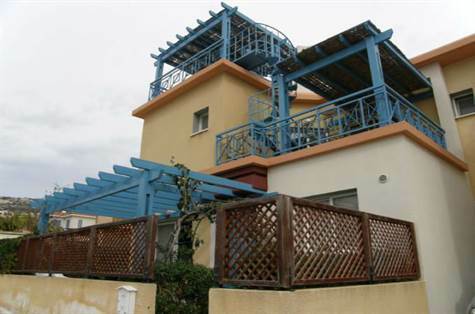 Peyia, Paphos - This 3 bedroom, 3 bathroom property is located in Peyia and is a great value for the money. There is one bedroom on the ground level and two more on the upper level. The eat-in kitchen is spacious and bright with plenty of cupboard space and the roof terrace is great for outdoor dining as it conveniently features a built in BBQ and sink. From here you can enjoy the view of the coast. The home is air conditioned and features a fireplace in the living room. Light fittings are in all rooms also. The community has a pool for use by residents. The owners are including all white goods and furnishings with the sale.